After making this easy dish and getting rave reviews from friends, I received many requests from friends to share this easy fish recipe with them. When it comes to cooking, I am a true believer of ready-made sauce. Why go through all these troubles of making from scratch? Who has the time?? -I used Tilapia fillets from Costco. They are inexpensive and easy to prepare. I coat fillets very lightly with corn starch and cook it in boiling water for a couple of minutes until ready. That is it for fish preparation. Or you can just steam it. I think with corn starch coating somehow the fish fillets become really tender. -Add oil and soy bean crumbs in pan and saute for couple of minutes on medium low heat. -Add garlic and continue to saute until garlic becomes golden. Do not cook on high heat because overcooked garlic will become bitter. -I added just a little dash of salt but it may not be necessary depending on personal taste bud. Taste the sauce to adjust salt level. -To keep everything hot, I was cooking both the fish and the sauce at the same time. I love soy bean crumbs, I can easily eat this sauce with plain noodle with some vegetable on the side. 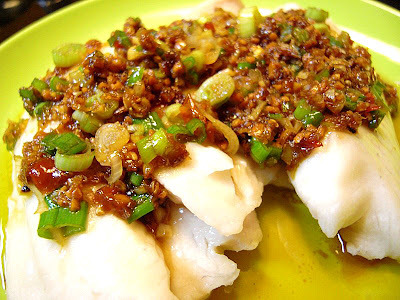 What is your favorite steam fish dish?? I love using soy bean paste. It has such a tangy and salty flavor. Mmm that recipe looks great. Thanks for sharing! I like buying white fish fillets, but I usually cook it en papillote. It's a fat-free way of cooking the fish, quick and super-easy. I love fish and this looks so good. Also it's good for you. Thanks for sharing the recipe! YUM!